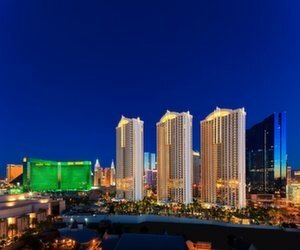 These five stars, luxurious Las Vegas hotels with no casino, located on or just minutes away from the Strip, are ideal if you want some quiet time for you and your family in the middle of all the action and casinos.The hotels we are recommending below are fully functional resorts. They all are offering tranquil respite and swimming pools so you could spend there all day without ever leaving the hotel grounds. Review: MGM Signature is a non-casino, no-smoking, all-suites condo type part of MGM Grand hotel. It's one of the most intimate best Las Vegas hotels without casino - this condo complex is located directly behind MGM Grand in a secluded area off the Strip. It's ideal if you are looking for some quiet time, and still want to be close too all the fun! MGM Signature consists of three towers with condo suites. Each suite has a fully equipped kitchen. Each tower has a swimming pool with cabanas where you can relax. The hotel charges resort fee for using it's facilities. 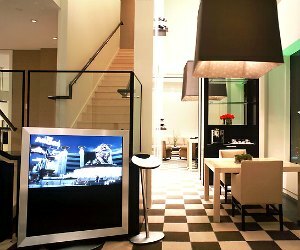 Guests of the Signature are also free to use all the facilities of MGM Grand. There are a few small dining facilities at the hotel, including gourmet delicatessen and Starbucks, but plenty of restaurants to go to at the MGM Grand and other nearby 5 star hotels in Las Vegas. Review: Choose Trump Hotel if you need a non-smoking non-casino and pet-friendly environment. 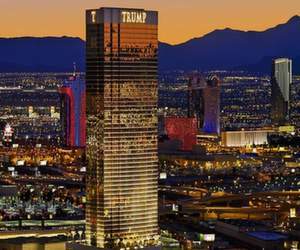 Being one of the trendiest best Las Vegas luxury hotels, Trump offers its guests a pampering, comfortable experience, for a relatively low price. Please note that there is a resort fee of $25. Guests can enjoy the pool deck with private cabanas, relaxing spa services, like most best Las Vegas luxury hotels. For dining, there are two restaurants: a classy DJT offering American cuisine, and H2(EAU) - a casual restaurant at the poolside, offering seafood, salads and other American dishes. While there aren't many activities at the Trump, the hotel offers free shuttle to other popular hotels such as Wynn. 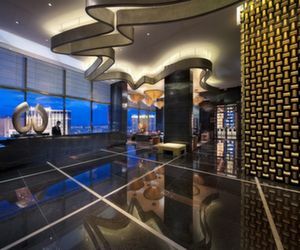 Review: Mandarin Oriental hotel occupies 47 floors, and is part of the CityCentre - an beautiful project created by MGM Mirage. It's luxurious rooms can serve as a standard of comfort and calm, relaxed atmosphere. All hotel rooms have large windows to enjoy the views of the busy Strip and the desert around the city. Dining choices include modern French cuisine at Twist - a restaurant by famous French chef Pierre Gagnaire, and contemporary Asian cuisine at MOzen Bistro. In the evening, you can relax and sip sophisticated cocktails at Mandarin Bar with large windows and amazing view of the Strip. Spa at Mandarin Oriental, a winner of the prestigious Forbes Five-Star award, combines modern procedures with traditional Eastern approaches. Among their services, they offer foot spa, steam rooms, and relaxation areas separate for men and women. Review: Delano is a luxury extension of Mandalay Bay Resort, located in a 43-storey gold-and-glass building. While Delano, one of best Las Vegas luxury hotels, provides a luxury, relaxing atmosphere, you can find a lot of things to do at the nearby Mandalay Bay packed with fun. The rooms at Delano offer great views of the pool, the Strip, or rocky mountains. Main attraction of the hotel is a huge aquarium called Shark Reef - with real sharks and other sea creatures. Closeness to Mandalay Bay assures access to prime night clubs, live music, world class pools and restaurants and other things to do. The Skylofts at MGM Grand are the luxury escape you have been dreaming about. These loft-style suites are uniquely located on the top of the MGM Grand Tower and offer spectacular views of the Las Vegas Strip and skyline. Each of the 51 loft-style suites is two levels with huge windows, a separate sleeping area, a fully functional kitchen, and several high-end electronic amenities like iPod docking stations and several flat screen televisions. The two bedroom suite also includes a gaming room with either a foosball or pool table and an over-sized master bathroom with spa tub. Guests can enjoy all of the various amenities that are associated with MGM Grand Resort and Casino. From gambling to relaxing to dining to shopping this complex offers the perfect get away experience. Guests are transported from McCarran Airport to this five-stars Las Vegas resort aboard a luxury limousine to start and end their guest experience.